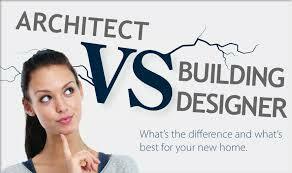 Peter Tesar Architectural Design - What's the difference between an architect and a building designer? What’s the difference between an architect and a building designer? You could easily be forgiven for not knowing the difference between an architect and a building designer. They ’re both employed to design buildings – and they share many common skills and offer very similar services if you ’re looking to build or significantly renovate a house. Depending on the skills and qualifications of individual practitioners, the distinction between these two professions can be a wee bit murky, but there ’s one key distinction that ultimately draws the line between the two: to legally call yourself an architect, you need to be registered with a State-based architecture board. Registration with the state architecture body is what defines an ‘architect’, for professional and legal purposes. Even if a person has several degrees in architecture and many years of professional experience, it ’s illegal for them to trade as an ‘architect’ if they&apos;re not officially registered as one. Academically speaking, architects study both the art and the science of building design in considerable depth. Architects normally spend at least five years at university, covering technical design and other things like history and contract law. Graduates are normally required to do two years of practical work under a registered architect before they&apos;re eligible for registration as an architect themselves. Building designers can come from a number of design & construction-related backgrounds. This includes people with degrees and experience in architecture who aren ’t officially registered as architects, as well as people who have extensive formal education in any number of design fields. Which should I hire – an architect or a building designer? There&apos;s no right answer to this question. You can get an equally spectacular design from either an architect or building designer. There&apos;s also a general misconception about cost, too. Many people wrongly assume that an architect will always be more expensive by default. While less costly projects are likely to be better suited to a building designer, prices and pricing structures can vary quite a bit, and highly sought-after building designers are likely to charge appropriately for their services, for instance a building designer with construction knowledge is worth their weight in gold compared to a qualified Architect with no hands-on build knowledge. The best choice is the architect or designer that looks like they ’ll best fulfill your needs, and provides the best bang for your budget.